Art Start students learned about William Morris and his fabulous wallpaper patterns for this chalk pastel drawing project. 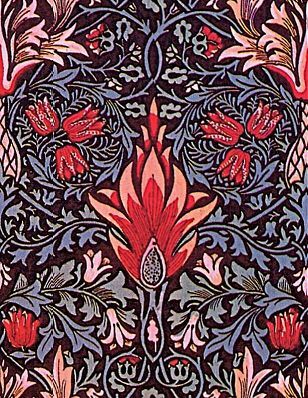 During the 1800's, William Morris was a famous British poet, novelist, furniture and textile designer and political activist. Anna using "window makers" while practice sketching. William Morris wallpaper patterns are still popular today and can also be found on stationery, fabric, picture frames and calendars (like we used for reference). Art Start students chose their favorite pattern from several dozen reproductions. They used tag board "window makers" to focus in on one area. Next we moved on to larger, final drawings on gray charcoal paper. Artists drew with black oil pastel, then added color with chalk pastels (below). I sprayed the finished drawings with fixative to prevent smudging.